An Alabama federal judge overseeing all federal breast implant lawsuits plans to consolidate discovery for the federal cases and to coordinate state cases, said a Chicago lawyer who represents women suing implant makers. The federal Judicial Panel on Multidistrict Litigation transferred the federal cases earlier this summer to Chief U.S. District Sam C. Pointer Jr. of the Northern District of Alabama in Birmingham. Pointer will probably impose a 12-month discovery cutoff and consider whether to decertify the class in the previously certified federal class action, said Chicago lawyer Kenneth B. Moll. Moll added that Pointer has said that after a year he might return the federal cases to the jurisdictions in which they were originally filed. "He doesn't want repetitive discovery. He wants consistency" in rulings, said Moll, a principal in McDowell, Moll, Fitzgibbons, and Drew Ltd. Discovery and other case materials will be included in a central computer depository in Birmingham but should be available to all lawyers representing clients in the federal and state cases, Moll said. Standardized complaints, answers and other pleadings also will be used, he added. Pointer "is asking for the cooperation of all state judges to hold off on discovery" probably until an Aug. 21 hearing, Moll added. Pointer appointed Moll during July as the liaison counsel for the State of Illinois. The judge asked the liaison counsel to try to contact all other lawyers involved in breast implant litigation in their states and gather information about each individual claim. 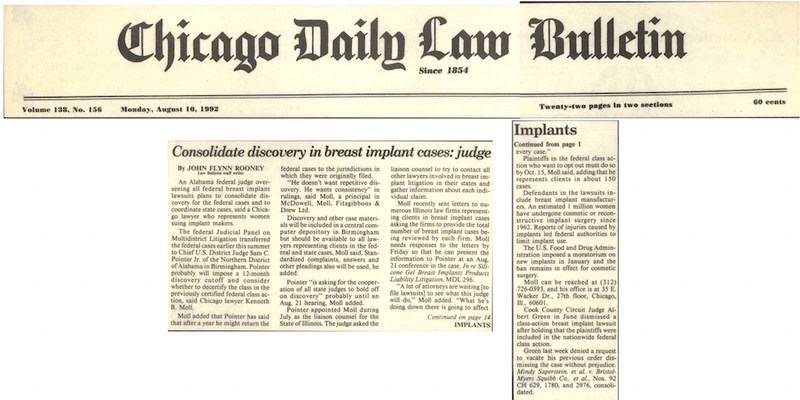 Moll recently sent letters to numerous Illinois law firms representing clients in breast implant cases asking the firms to provide the total number of breast implant cases being reviewed in each firm. Moll needs responses to the letters by Friday so that he can present the information to Pointer in an August 21 conference in the case. In re Silicone Gel Breast Implants Products Liability Litigation, MDL 296. "A lot of attorneys are waiting [to file lawsuits] to see what this judge will do," Moll added. "What he's doing down there is going to affect every case." Defendants in the lawsuits include breast implant manufacturers. An estimated 1 million women have undergone cosmetic or reconstructive implant surgery since 1962. Reports of injuries caused by implants led federal authorities to limit implant use. Moll can be reached at (312) 726-0393, and his office is at 35 E. Wacker Dr., 27th floor, Chicago, Ill., 60601. Cook County Circuit Judge Albert Green in June dismissed a class-action breast implant lawsuit after holding that the plaintiffs were included in the nationwide federal class action. Green last week denied a request to vacate his previous order dismissing the case without prejudice. Mindy Saperstein, et al. v. Bristol-Meyers Squibb Co., et al., Nos. 92 CH 629, 1780, and 2976, consolidated.